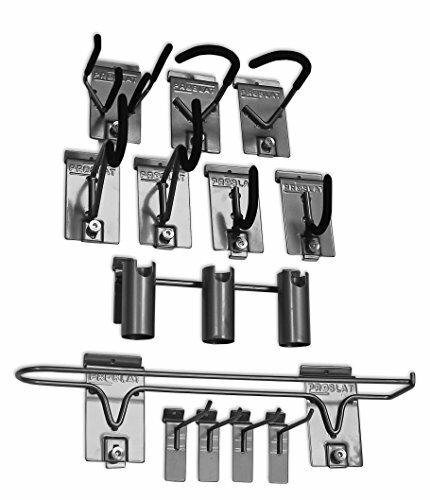 The Proslat sports hook kit will organize any athlete. Sports equipment is expensive enough on its own; our hooks are designed to hold almost anything you want at a fraction of the cost. This efficient kit can hang four bicycles, two golf bags, 3 fishing rods, snowboard or skateboard, 1 pairs of skis and poles, plus a few extra 4-inch universal hooks for any accessory you may have. Includes: four 4-inch hooks, two Heavy duty bike hooks, 2 vertical bike hooks, one ski hook, two "U" hooks, one fishing rod holder, and one board rack. If you have any questions about this product by Proslat, contact us by completing and submitting the form below. If you are looking for a specif part number, please include it with your message.